Perspective is something that’s often overlooked in life. The view from behind the wheel of your Mustang is quite familiar. So is the sight of it sitting in your driveway. If you’re in a club, images of your Pony running in a large herd are not easily forgotten. 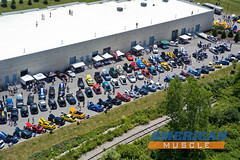 But when you’re staring more than 500 feet straight down at your top-tuned and polished-to-perfection Mustang surrounded by 150 equally awesome ‘Stangs at the 1st Annual AmericanMuscle Car Show and Charity Event, that image will change your perspective. 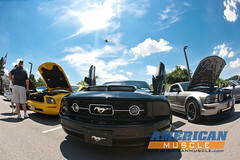 Sunday, July 19, the streets of Malvern, PA were flooded with Mustangs from across the East as new and old pony cars converged on AmericanMuscle’s summertime blowout. With a lot stuffed full with Mustangs of every generation and color, people walked the grounds checking out the precious metal, free dyno in action and the AmericanMuscle Girls, just to name a few. Of course, I’m not saying which I liked best. After looking at these pictures taken from a helicopter, next year I’m thinking we should park cars on the lawn, and maybe the roof. Any suggestions? Previous Entry AM Car Show: The Movie-Because Reading is Overrated! That’s a lot of ponies. Looks like a great show from this angle. Hey just wanted to tell you guys that you put on a great party on sunday. I call it a party because it was too good to just be a car show. I was there with the Garden State Mustang Club and we all had a blast. Good luck and see you guys next year. Howdy! I just wanted to leave a comment and say you guys threw one AMAZING show for an equally awesome cause. My hat is off to everyone involved in making this event happen. 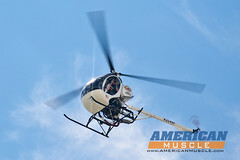 We cruised well over 140+ miles for this event and had a great time. The NJstangers will definitley be back next year! Also a HUGE thanks to the photographer who took the shot of my blacked out mustang while i was leaving the show at the end of the day. Must be my favorite picture ever of the car. Thanks!!! I was there with my club (Valley Forge Mustang Club) and my girlfriend and I had a blast! My car was the Vista Blue GT coupe with white striipes and Shelby CS67 wheels, & her car was the Grabber Orange GT/CS with the glitter black stripes! The first time anyone at a show had seen them. Congrats to all involved ! This was one Great event with an even greater cause. The Mustangs were awesome. The donation to the Homes for Troops was Truly a great achievement on behalf of American Muscle. Great Job and see you next year! Couldn’t make it this year. 200 miles can be a long drive for a Sunday morning, even in an SN95. Sounds like a great show. Heard the dyno was free. How was that? I’ll blow off all yer doors with my ’69 Camaro!! CHEVY POWER RULES!!!!!! Last I recalled, this is a mustang site? yeah gRUMPY, ’69 was a great year for a camaro, but you also admitted to owning a VEGA? Just a quick message to let everyone know we have launched our new layout site with 1000’s of layouts, games, codes, graphics, effects, polls, backgrounds, and more for Myspace. New Myspace 2.0 layouts, backgrounds, games, widgets and more!! Please forward this on to your friends as well to help us promote our site. Very superior post. I simply stopped by by your website and wanted to state that I’ve really loved searching your posts. Any approach, I’ll be subscribing to your RSS feed and in addition I hope you post once more quickly! I have to show my affection for your generosity in support of women who must have help with the concern. Your personal commitment to getting the message around appeared to be especially interesting and has in every case permitted guys and women just like me to realize their ambitions. This warm and friendly help and advice can mean so much a person like me and far more to my colleagues. Thanks a lot; from each one of us.